From their debut at Carnegie Hall, this piano trio leads the way on a journey to explore the piano trio repertoire with a unique synergy of brilliant technique, probing musicianship and a breadth of experience. The group, from Tallahassee, Florida brings energy, insight, and incredible talent to Baur’s historic salon. 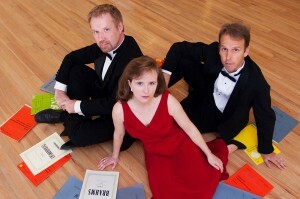 Originally founded in 2008, the members of Trio Solis include Corinne Stillwell on violin, Greg Sauer on cello and Read Gainsford on piano. In addition to performing live all across the U.S. the members teach and maintain full studios at the College of Music at Florida State University. The group is committed to sharing music and educating both at the university level and in concert. Regularly featured artist in the Biennial Festival of New Music in Tallahassee, Florida, they invest their time in master classes, and school residencies as well as in Building Bridges in the Big Bend concert annually, an initiative that collaborate with young promising musicians and benefiting the surrounding community organizations. This is a rare opportunity to witness this talented piano trio at Baur’s Listening Lounge. This performance is brought you by the Music Appreciation Society. Get your tickets to this wonderful show now!